Mol. Cells. Feb 28, 2017; 40(2): 83-89. Error-free replication and repair of DNA are pivotal to organisms for faithful transmission of their genetic information. Cells orchestrate complex signaling networks that sense and resolve DNA damage. Post-translational protein modifications by ubiquitin and ubiquitin-like proteins, including SUMO and NEDD8, are critically involved in DNA damage response (DDR) and DNA damage tolerance (DDT). The expression of interferon-stimulated gene 15 (ISG15), the first identified ubiquitin-like protein, has recently been shown to be induced under various DNA damage conditions, such as exposure to UV, camptothecin, and doxorubicin. Here we overview the recent findings on the role of ISG15 and its conjugation to target proteins (e.g., p53, ΔNp63α, and PCNA) in the control of cellular responses to genotoxic stress, such as the inhibition of cell growth and tumorigenesis. Cells continuously encounter a wide variety of intrinsic and extrinsic stresses that damage the integrity of DNA (Lindahl and Barnes, 2000). Mitochondrial respiratory chain generates reactive oxygen species (ROS), which are the most prevalent intrinsic source of DNA damage. Extrinsic sources of DNA damage are ionizing radiation (IR), ultraviolet (UV), and genotoxic chemical agents, including chemotherapeutic drugs (e.g., camptothecin, doxorubicin, and etoposide). Both of the sources attack DNA and produce DNA lesions or breaks (Dipple, 1995). If not properly repaired, these damages are capable of blocking DNA replication and transcription, leading to mutations or genome aberrations, which consequently give rise to various human diseases, such as cancer. To maintain genome stability against the stresses, cells operate DNA damage response (DDR) to detect DNA lesions, signal their presence, and promote their repair (Harrison and Haber, 2006; Harper and Elledge, 2007; Rouse and Jackson, 2002). If DDR alone cannot completely handle DNA damage, cells employ an additional defense mechanism, called DNA damage tolerance (DDT) that allows DNA replication with the bypass of DNA lesions, which eventually is repaired at a later stage (Sale et al., 2012). Both DDR and DDT are tightly controlled by post-translational protein modifications (PTMs), including phosphorylation, acetylation, methylation, poly (ADP-ribosyl)ation, and modification by ubiquitin and ubiquitin-like proteins (UBLs). Ubiquitin and UBLs are henceforth referred to as the ubiquitin family. When cells are seriously damaged by genotoxic stresses and cannot be repaired by DDR and DDT, they are then committed to kill themselves through a suicide process, called apoptosis. PTMs are also critically involved in the control of apoptotic process for selective and permanent elimination of damaged cells. UBLs are small-size polypeptides whose three-dimensional structures are strikingly similar to that of ubiquitin, although the similarity in their amino acid sequences to ubiquitin significantly varies (Kerscher et al., 2006). So far more than ten UBLs have been identified and they include ATG8, FAT10, HUB1, ISG15, NEDD8, SUMO(1–4), UFM1, and URM1 (Jentsch and Pyrowolakis, 2000). Most UBLs are conjugated to specific target proteins by a three-enzyme cascade system (E1, E2, and E3) that resembles ubiquitination. Protein modifications by ubiquitin and UBLs are reversible processes that are catalyzed by isopeptidases, called deubiquitinating enzymes (DUBs) and UBL-specific proteases (ULPs), respectively. These reversible protein modification processes play important roles in the regulation of key cellular processes, including cell proliferation, cell differentiation, and apoptosis. Furthermore, deregulation of these modification systems results in a wide variety of human diseases, including cancer, neurodegenerative disorders, and immune diseases. Of the ubiquitin family, the roles of ubiquitin, SUMO, and NEDD8 in the control of DDR and DDT as well as of apoptosis have been extensively studied and reviewed in detail (Brown and Jackson, 2015; Dantuma and van Attikum, 2016; Jackson and Bartek, 2009; Roos et al., 2016). However, relatively little is known about the function of ISG15 under DNA damage conditions. In this review, we overview the recent progress made in exploring the functional significance of ISG15 and its reversible modification of target proteins in the regulation of cellular responses to genotoxic stress and thus in their implication in human diseases, particularly cancer. The product of interferon (IFN)-stimulated gene 15 (ISG15) is the first reported UBL (Haas et al., 1987). This 15-kDa protein consists of two ubiquitin-like domains corresponding to the N- and C-terminal regions, which share 29% and 31% amino acid sequence identities with ubiquitin, respectively (Haas et al., 1987; Jeon et al., 2010). Like ubiquitination, ISG15 is conjugated to target proteins by an enzymatic cascade: ISG15-activating E1 enzyme (UBE1L), ISG15-conjugating E2 enzyme (UBCH8), and ISG15 E3 ligases (e.g., HERC5 and EFP) (Kim et al., 2004; Wong et al., 2006; Yuan and Krug, 2001; Zhao et al., 2004; Zou and Zhang, 2006). This conjugation process can be reversed by the major deISGylating enzyme UBP43, also called USP18 (Malakhov et al., 2002). ISG15 is not present in Drosophila, Caenorhabditis, and Saccharomyces, indicating that its functions are restricted to higher animals. ISG15 is robustly induced by type-I IFNs, lipopolysaccharide, and viral infection (Farrell et al., 1979; Kim et al., 2002; Loeb and Haas, 1992; Malakhova et al., 2002). One of the major components of the innate immune response is the activation of type I IFN signaling pathways (Platanias, 2005; Taniguchi and Takaoka, 2001). Proteomic analysis has revealed that regulatory proteins involved in antiviral IFN signaling pathways, such as RIG-I, IRF3, MDA-5, STAT1, JAK1, and filamin B, serve as targets for ISG15 modification (Arimoto et al., 2008; Jeon et al., 2009; Kim et al., 2008; Zhao et al., 2005). Moreover, ISG15 and its conjugation to target proteins have been implicated in impairment of viral replication in vivo (Lu et al., 2006; Malakhova and Zhang, 2008; Okumura et al., 2008). Conversely, certain viruses induce their own proteins that can block the expression of ISG15 (e.g., NS3/4A) or generation of ISG15-conjugated proteins (e.g., NS1B) or promote deconjugation of ISG15 from its target proteins (i.e., deISGylating enzymes, including OTU, PLpro, and viral E3 protein), thus abrogating the antiviral immune responses (Frias-Staheli et al., 2007; Lindner et al., 2005; Loo et al., 2006; Ratia et al., 2008; Yuan and Krug, 2001; Zhao et al., 2016). In addition, mice lacking ISG15 or UBE1L exhibit increased susceptibility to infection by certain viruses, including influenza B virus, herpes simplex virus, and/or Sindbis virus (Giannakopoulos et al., 2009; Lai et al., 2009; Lenschow et al., 2007), further indicating the role of ISG15 and its conjugation of target proteins in antiviral responses. ISG15 is also induced by genotoxic stresses. UV was first shown to increase the level of ISG15 transcripts by about four fold in human skin fibroblasts (Gentile et al., 2003). Camptothecin, an inhibitor of topoisomerase I, also increases the level of ISG15 mRNA and this increase requires protein synthesis and a functional p53 protein (Liu et al., 2004). Significantly, camptothecin-mediated induction of ISG15 is independent of IFN signaling pathway and ISG15 conjugates formed by the drug treatment are different from those generated by type I IFNs, indicating that different signals induce ISGylation of different target proteins (Park et al., 2016). Moreover, the ISG15 gene has a putative p53-responsive element (p53RE) for its induction in addition to IFN-sensitive response element (ISRE) (Reich et al., 1987). Collectively, these findings suggest that ISG15 and its conjugated proteins participate in the control of cellular responses to DNA damage. The p53 tumor suppressor coordinates cellular responses to DNA damage as well as to other stresses, such as abnormal oncogene activation, telomere erosion, and hypoxia (Green and Kroemer, 2009; Riley et al., 2008). Under normal conditions, the level of p53 protein is kept low by several E3 ligases-mediated ubiquitination. Among them, MDM2 is the major ubiquitin E3 ligase that leads to degradation of p53 by proteasome. Interestingly, the expression of MDM2 is induced by p53, thus forming a negative feedback loop for down-regulation of p53 (Ashcroft and Vousden, 1999; Oliner et al., 1992; Wu et al., 1993). Under stressed conditions, however, the interaction of p53 with MDM2 and other negative regulators is disrupted by phosphorylation and acetylation, leading to stabilization and activation of p53. The activated p53 then binds to p53REs for transcriptional activation of its target genes (e.g., BAX, CDKN1, and PUMA) that mediate cell cycle arrest and/or apoptosis, depending on the degree of stresses (el-Deiry et al., 1994; Miyashita and Reed, 1995; Nakano and Vousden, 2001). Recently, we have shown that p53RE is present not only in the ISG15 gene but also in the promoter regions of the genes encoding UBE1L (E1), UBCH8 (E2), and EFP (E3), all of which are henceforth referred to as the ISG15-conjugating system (Park et al., 2016). Accordingly, treatment with DNA-damaging agents, such as UV, camptothecin, and doxorubicin, markedly induces both the mRNA and protein levels of UBE1L, UBCH8, and EFP in p53+/+ cells, but not in p53−/− cells, and this induction can be abrogated by caffeine, an inhibitor of ATM/ATR kinases (Sarkaria et al., 1999), which phosphorylate Chk1 and p53 for the expression of p53. In addition, DNA damage-mediated induction of the ISG15-conjugating system is independent of type I IFNs, indicating that p53 alone can positively regulate the expression of ISG15 and its conjugation system. DNA-damaging agents are capable of inducing ISGylation of p53 as well as overexpression of the ISG15-conjugating system (Park et al., 2016). Lys291 and Lys292 serve as the major ISG15-acceptor sites in p53. Of two known ISG15 E3 enzymes, EFP, but not HERC5, acts as a p53-specific ligase. HERC5 lacks p53RE, consistently with the finding that the ligase is not induced under DNA-damaging conditions. Intriguingly, ISGylation of p53 promotes its transcriptional activity and in turn in the expression of its downstream target genes, including CDKN1, MDM2, BAX, and ISG15, as well as of its own gene. This increase of the p53 activity is mediated by the ability of ISG15-conjugated p53 to promote its phosphorylation and acetylation and thereby to increase its affinity toward p53RE. Furthermore, p53 ISGylation suppresses cell growth and tumor development in vivo. Knockdown of ISG15 or any of the ISG15-conjugating system or Lys-to-Arg mutations of the ISG15 acceptor sites in p53 strongly attenuates DNA damage-induced p53 activity and in turn its tumor suppressive function (Park et al., 2016). Thus, cells appear to operate a novel feedback circuit between p53 and the ISG15-conjugating system for positive control of p53 tumor suppressive function under genotoxic stress conditions. The p53 protein family consists of p53, p63, and p73. Different isotypes can be generated from their genes due to the presence of different promoters (Levine et al., 2011). For example, the p63 gene generates two types of transcripts: one for p63 having an N-terminal transactivation domain (TA) and the other for p63 lacking TA domain (ΔN). In addition, both TA and ΔN transcripts are differentially spliced at their 3′ ends to generate the p63 proteins with unique C-termini, termed α, β, γ, δ, and ɛ (Melino, 2011). Similar to p53, TAp63 isotypes can activate transcription from p53-responsive genes, which induce cell cycle arrest and apoptosis, thus also functioning as tumor suppressors (Flores et al., 2002; Suh et al., 2006). Of the p63α isotypes, ΔNp63α has the transactivation inhibitory domain (TI) but lacks the TA domain and therefore can dominant-negatively suppress transcriptional activation of the p53 family member by binding to their TA domains (Guo et al., 2009; Sayan et al., 2007; Yang et al., 1998), contributing to its anti-apoptotic, mitogenic, and tumorigenic functions. ΔNp63α is the most abundant p63 isotype in many proliferating epithelial cells, such as MCF10A (Carroll et al., 2006; Mills et al., 1999; Yang et al., 1999). Significantly, its expression is frequently amplified in human epithelial cancers, such as squamous cell carcinomas, advanced cervical carcinomas, and human breast carcinomas, supporting its role in tumorigenesis (Hibi et al., 2000; Leong et al., 2007). DNA-damaging agents, such as camptothecin and doxo-rubicin, induce ISGylation of ΔNp63α in MCF10A and various epithelial cancer cell lines, including HNSCC013, HCC1937, and FaDu (Jeon et al., 2012). Lys139 and Lys324 serve as the ISGylation sites in ΔNp63α. 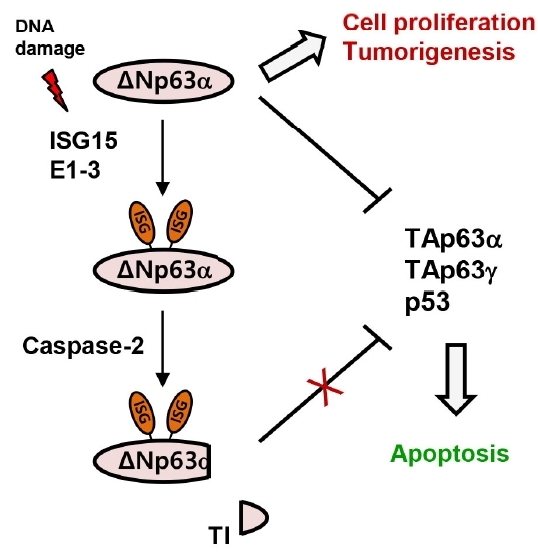 Upon exposure to the DNA-damaging agents, caspase-2 is activated, although with an unknown mechanism(s), and cleaves off the TI domain from ISGylated ΔNp63α, but not from its unmodified form, suggesting that ISG15 molecules conjugated toΔNp63α act as molecular scaffolds for recruiting activated caspase-2. Asp452, Asp469, and Asp489 are the cleavage sites in ΔNp63α. The cleaved TI domain is exported to the cytoplasm from the nucleus, thus losing its ability to bind the TA domain and inhibit the transcriptional activity of TA domain-containing p53 family members in the nucleus. Under the same stress conditions, TAp63α, is also ISGylated and cleaved by caspase-2 and its TI domain is released to the cytoplasm, thus yielding a transcriptionally active form of TAp63α. Furthermore, ISGylation of ΔNp63α abrogates its ability to induce cell growth and tumor formation (Jeon et al., 2012). Knockdown of ISG15, Lys-to-Arg mutations of ISGylation sites, or Asp-to-Ala mutations of cleavage sites by caspase-2 strongly potentiate the ability of ΔNp63α to promote anchorage-independent cell growth and tumor development in vivo. These findings indicate that ISG15 and its conjugation to ΔNp63α play critical roles in suppression of tumor-igenesis particularly in epithelial cancer cells under genotoxic stress conditions. As both camptothecin and doxorubicin are well-known anticancer drugs, these findings also provide a molecular basis for chemotherapeutic drugs against ΔNp63α-mediated cancers. Notably, cisplatin, unlike camptothecin and doxorubicin, is unable to induce the ISG15-congugating system and ΔNp63α ISGylation, although it also acts as a DNA-damaging agent as well as an anticancer drug. However, cisplatin is capable of inducing cAbl-mediated phosphorylation of TAp73, which causes the dissociation of TAp73 from ΔNp63α and in turn the promotion of its transcriptional activity to induce apoptosis (Leong et al., 2007). Thus, cisplatin, like camptothecin and doxorubicin, impairs the dominant-negative function ofΔNp63α toward TA domain-containing p53 family members, although it does not exhibit any effect on ISGylation and caspase-2-mediated cleavage of ΔNp63α, unlike camptothecin and doxorubicin. The sliding clamp proliferating cell nuclear antigen (PCNA) serves as a processivity factor as well as a platform for recruiting necessary components for DNA replication. Moreover, PCNA is critically involved in DNA lesion bypass by acting as a scaffold that recruits essential components for DDT (Moldovan et al., 2007), indicating that PCNA plays an additional key role in the maintenance of genome stability and cell survival under DNA damage conditions. When replicating cells encounter DNA damage, PCNA undergoes numerous PTMs, such as ubiquitination and sumoylation (Bergink and Jentsch, 2009; Jackson and Durocher, 2013; Mailand et al., 2013; Ulrich and Walden, 2010). UV induces mono-ubiquitination of a highly conserved Lys164 residue in PCNA by the ubiquitin E3 ligase RAD6-RAD18 complex (Hoege et al., 2002). This PCNA ubiquitination triggers the replacement of replicative DNA polymerases, such as Polη, by damage-tolerant Y family of DNA polymerases, including Polδ, for translesion DNA synthesis (TLS) (Bienko et al., 2005; Kannouche and Lehmann, 2004; Kannouche et al., 2004; Lehmann et al., 2007; Stelter and Ulrich, 2003). TLS polymerases bypass DNA lesion and therefore DNA replication can proceed without the need of removal of the damage and the risk of fork collapse (Sale, 2012; Sale et al., 2012). However, TLS polymerases lack proofreading activity and frequently incorporate incorrect nucleotides, therefore are potentially mutagenic (Loeb and Monnat, 2008; Matsuda et al., 2000; Sale, 2012; Sale et al., 2012). Thus, error-prone TLS polymerases have to be released from PCNA after DNA lesion bypass for preventing excessive mutagenesis. Upon DNA damage by UV, PCNA consisting of three identical subunits is first mono-ubiquitinated (at Lys164) for recruitment of Polη and thus for initiation of TLS, as previously documented in detail (Bienko et al., 2005; Kannouche and Lehmann, 2004; Kannouche et al., 2004; Lehmann et al., 2007; Stelter and Ulrich, 2003). After DNA lesion bypass, the ISG15 E3 ligase EFP, but not HERC5, is tethered to mono-ubiquitinated PCNA, and generates mono-ISGylated PCNA (at Lys168), leading to formation of PCNA conjugated with both ubiquitin and ISG15 in different subunits (Park et al., 2014). ISGylated PCNA then recruits PCNA-interacting peptide (PIP) motif-containing USP10 for deubiquitination of PCNA, which causes the release of Polη from PCNA for termination of TLS. EFP conjugates an additional ISG15 to PCNA at Lys164, thus forming PCNA ligated with two ISG15 molecules in the same subunit, likely for preventing mono-ubiquitination at Lys164 and re-recruitment of Polη. Finally, UBP43 is induced at a later period and cleaves off ISG15 molecules from PCNA for reloading of replicative DNA polymerases and resuming of DNA replication. For this sequential modification of PCNA (i.e., mono-ubiquitination, ISGylation, deubiquitination, ISGylation, and deISGyation), expression of the proteins responsible for the processes (i.e., RAD6-RAD18, ISG15 and EFP, USP10, and UBP43) is induced in order after UV irradiation, although it remains mysterious how the timely expression of each component of PCNA modifications is regulated. Moreover, knockdown of any of ISG15, EFP, and USP10 as well as Lys-to-Arg mutations of the ISGylation sites in PCNA lead to a dramatic increase in UV-mediated mutation frequency with a decrease in cell survival (Park et al., 2014). Thus, PCNA ISGylation appears to play a crucial role in termination of error-prone TLS after DNA lesion bypass for escaping from excessive mutagenesis and thereby maintaining genome stability. Type I IFNs and viral and microbial infections induce the expression of ISG15. Further, its conjugation to target proteins plays essential roles in innate immune responses, such as anti-viral and anti-microbial functions. Recent studies indicate that ISG15 and its conjugating system, including UBE1L (E1), UBCH8 (E2), and EFP (E3), are also induced under DNA damage conditions and this induction is positively regulated by p53. Moreover, p53-mediated increase in the levels of ISG15 and its conjugating system leads to ISGylation ofΔNp63α and PCNA as well as itself. ISGylation of p53 forms a positive feedback loop for its transcriptional activation, resulting in the expression of p53-downstream target genes for cell cycle arrest and apoptosis under DNA damage conditions. On the other hand, DNA damage-induced ISGylation of ΔNp63α negatively regulates its anti-apoptotic and mitogenic functions by caspase-2-mediated destabilization. In addition, reversible PCNA ISGylation relays a signaling pathway to turn off error-prone TLS after DNA lesion bypass for suppressing UV-induced mutagenesis as well as for resuming normal DNA replication. Thus, it appears clear that ISG15 and its conjugation to target proteins play a crucial function in the control of cellular responses to genotoxic stresses and in turn in suppression of DNA damage-mediated tumor-igenesis. Mol. Cells.Feb 28, 2017; 40(2): 83-89. Received February 21, 2017; Accepted February 23, 2017. Arimoto, K., Konishi, H., and Shimotohno, K. (2008). UbcH8 regulates ubiquitin and ISG15 conjugation to RIG-I. Mol Immunol. 45, 1078-1084. Ashcroft, M., and Vousden, K.H. (1999). Regulation of p53 stability. Oncogene. 18, 7637-7643. Bergink, S., and Jentsch, S. (2009). Principles of ubiquitin and SUMO modifications in DNA repair. Nature. 458, 461-467. Bienko, M., Green, C.M., Crosetto, N., Rudolf, F., Zapart, G., Coull, B., Kannouche, P., Wider, G., Peter, M., and Lehmann, A.R. (2005). Ubiquitin-binding domains in Y-family polymerases regulate translesion synthesis. Science. 310, 1821-1824. Brown, J.S., and Jackson, S.P. (2015). Ubiquitylation, neddylation and the DNA damage response. Open Biol. 5, 150018. Carroll, D.K., Carroll, J.S., Leong, C.O., Cheng, F., Brown, M., Mills, A.A., Brugge, J.S., and Ellisen, L.W. (2006). p63 regulates an adhesion programme and cell survival in epithelial cells. Nat Cell Biol. 8, 551-561. Dantuma, N.P., and van Attikum, H. (2016). Spatiotemporal regulation of posttranslational modifications in the DNA damage response. EMBO J. 35, 6-23. Dipple, A. (1995). DNA adducts of chemical carcinogens. Carcinogenesis. 16, 437-441.
el-Deiry, W.S., Harper, J.W., O’Connor, P.M., Velculescu, V.E., Canman, C.E., Jackman, J., Pietenpol, J.A., Burrell, M., Hill, D.E., and Wang, Y. (1994). WAF1/CIP1 is induced in p53-mediated G1 arrest and apoptosis. Cancer Res. 54, 1169-1174. Farrell, P.J., Broeze, R.J., and Lengyel, P. (1979). Accumulation of an mRNA and protein in interferon-treated Ehrlich ascites tumour cells. Nature. 279, 523-525. Flores, E.R., Tsai, K.Y., Crowley, D., Sengupta, S., Yang, A., McKeon, F., and Jacks, T. (2002). p63 and p73 are required for p53-dependent apoptosis in response to DNA damage. Nature. 416, 560-564. Frias-Staheli, N., Giannakopoulos, N.V., Kikkert, M., Taylor, S.L., Bridgen, A., Paragas, J., Richt, J.A., Rowland, R.R., Schmaljohn, C.S., and Lenschow, D.J. (2007). Ovarian tumor domain-containing viral proteases evade ubiquitin- and ISG15-dependent innate immune responses. Cell Host Microbe. 2, 404-416. Gentile, M., Latonen, L., and Laiho, M. (2003). Cell cycle arrest and apoptosis provoked by UV radiation-induced DNA damage are transcriptionally highly divergent responses. Nucl Acids Res. 31, 4779-4790. Giannakopoulos, N.V., Arutyunova, E., Lai, C., Lenschow, D.J., Haas, A.L., and Virgin, H.W. (2009). ISG15 Arg151 and the ISG15-conjugating enzyme UbE1L are important for innate immune control of Sindbis virus. J Virol. 83, 1602-1610. Green, D.R., and Kroemer, G. (2009). Cytoplasmic functions of the tumour suppressor p53. Nature. 458, 1127-1130. Guo, X., Keyes, W.M., Papazoglu, C., Zuber, J., Li, W., Lowe, S.W., Vogel, H., and Mills, A.A. (2009). TAp63 induces senescence and suppresses tumorigenesis in vivo. NatCell Biol. 11, 1451-1457. Haas, A.L., Ahrens, P., Bright, P.M., and Ankel, H. (1987). Interferon induces a 15-kilodalton protein exhibiting marked homology to ubiquitin. J Biol Chem. 262, 11315-11323. Harper, J.W., and Elledge, S.J. (2007). The DNA damage response: ten years after. Mol Cell. 28, 739-745. Harrison, J.C., and Haber, J.E. (2006). Surviving the breakup: the DNA damage checkpoint. Annu Rev Genet. 40, 209-235. Hibi, K., Trink, B., Patturajan, M., Westra, W.H., Caballero, O.L., Hill, D.E., Ratovitski, E.A., Jen, J., and Sidransky, D. (2000). AIS is an oncogene amplified in squamous cell carcinoma. Proc Nat Acad Sci USA. 97, 5462-5467. Hoege, C., Pfander, B., Moldovan, G.L., Pyrowolakis, G., and Jentsch, S. (2002). RAD6-dependent DNA repair is linked to modification of PCNA by ubiquitin and SUMO. Nature. 419, 135-141. Jackson, S.P., and Bartek, J. (2009). The DNA-damage response in human biology and disease. Nature. 461, 1071-1078. Jackson, S.P., and Durocher, D. (2013). Regulation of DNA damage responses by ubiquitin and SUMO. Mol Cell. 49, 795-807. Jentsch, S., and Pyrowolakis, G. (2000). Ubiquitin and its kin: how close are the family ties?. Trends Cell Biol. 10, 335-342. Jeon, Y.J., Choi, J.S., Lee, J.Y., Yu, K.R., Kim, S.M., Ka, S.H., Oh, K.H., Kim, K.I., Zhang, D.E., and Bang, O.S. (2009). ISG15 modification of filamin B negatively regulates the type I interferon-induced JNK signalling pathway. EMBO Rep. 10, 374-380. Jeon, Y.J., Yoo, H.M., and Chung, C.H. (2010). ISG15 and immune diseases. Biochim Biophys Acta. 1802, 485-496. Jeon, Y.J., Jo, M.G., Yoo, H.M., Hong, S.H., Park, J.M., Ka, S.H., Oh, K.H., Seol, J.H., Jung, Y.K., and Chung, C.H. (2012). Chemosensitivity is controlled by p63 modification with ubiquitin-like protein ISG15. J Clin Inv. 122, 2622-2636. Kannouche, P.L., and Lehmann, A.R. (2004). Ubiquitination of PCNA and the polymerase switch in human cells. Cell cycle. 3, 1011-1013. Kannouche, P.L., Wing, J., and Lehmann, A.R. (2004). Interaction of human DNA polymerase eta with monoubiquitinated PCNA: a possible mechanism for the polymerase switch in response to DNA damage. Mol Cell. 14, 491-500. Kerscher, O., Felberbaum, R., and Hochstrasser, M. (2006). Modification of proteins by ubiquitin and ubiquitin-like proteins. Annu Rev Cell Dev Biol. 22, 159-180. Kim, M.J., Latham, A.G., and Krug, R.M. (2002). Human influenza viruses activate an interferon-independent transcription of cellular antiviral genes: outcome with influenza A virus is unique. Proc Nat Acad Sci USA. 99, 10096-10101. Kim, K.I., Giannakopoulos, N.V., Virgin, H.W., and Zhang, D.E. (2004). Interferon-inducible ubiquitin E2, Ubc8, is a conjugating enzyme for protein ISGylation. Mol Cell Biol. 24, 9592-9600. Kim, M.J., Hwang, S.Y., Imaizumi, T., and Yoo, J.Y. (2008). Negative feedback regulation of RIG-I-mediated antiviral signaling by interferon-induced ISG15 conjugation. J Virol. 82, 1474-1483. Lai, C., Struckhoff, J.J., Schneider, J., Martinez-Sobrido, L., Wolff, T., Garcia-Sastre, A., Zhang, D.E., and Lenschow, D.J. (2009). Mice lacking the ISG15 E1 enzyme UbE1L demonstrate increased susceptibility to both mouse-adapted and non-mouse-adapted influenza B virus infection. J Virol. 83, 1147-1151. Lehmann, A.R., Niimi, A., Ogi, T., Brown, S., Sabbioneda, S., Wing, J.F., Kannouche, P.L., and Green, C.M. (2007). Translesion synthesis: Y-family polymerases and the polymerase switch. DNA Repair. 6, 891-899. Lenschow, D.J., Lai, C., Frias-Staheli, N., Giannakopoulos, N.V., Lutz, A., Wolff, T., Osiak, A., Levine, B., Schmidt, R.E., and Garcia-Sastre, A. (2007). IFN-stimulated gene 15 functions as a critical antiviral molecule against influenza, herpes, and Sindbis viruses. Proc Nat Acad Sci USA. 104, 1371-1376. Leong, C.O., Vidnovic, N., DeYoung, M.P., Sgroi, D., and Ellisen, L.W. (2007). The p63/p73 network mediates chemosensitivity to cisplatin in a biologically defined subset of primary breast cancers. J Clin Inv. 117, 1370-1380. Levine, A.J., Tomasini, R., McKeon, F.D., Mak, T.W., and Melino, G. (2011). The p53 family: guardians of maternal reproduction. Nat Rev Mol Cell Biol. 12, 259-265. Lindahl, T., and Barnes, D.E. (2000). Repair of endogenous DNA damage. Cold Spring Harbor Symp Quant Biol. 65, 127-133. Lindner, H.A., Fotouhi-Ardakani, N., Lytvyn, V., Lachance, P., Sulea, T., and Menard, R. (2005). The papain-like protease from the severe acute respiratory syndrome coronavirus is a deubiquitinating enzyme. J Virol. 79, 15199-15208. Liu, M., Hummer, B.T., Li, X., and Hassel, B.A. (2004). Camptothecin induces the ubiquitin-like protein, ISG15, and enhances ISG15 conjugation in response to interferon. J Interferon Cytokine Res. 24, 647-654. Loeb, K.R., and Haas, A.L. (1992). The interferon-inducible 15-kDa ubiquitin homolog conjugates to intracellular proteins. J Biol Chem. 267, 7806-7813. Loeb, L.A., and Monnat, R.J. (2008). DNA polymerases and human disease. Nat Rev Genet. 9, 594-604. Loo, Y.M., Owen, D.M., Li, K., Erickson, A.K., Johnson, C.L., Fish, P.M., Carney, D.S., Wang, T., Ishida, H., and Yoneyama, M. (2006). Viral and therapeutic control of IFN-beta promoter stimulator 1 during hepatitis C virus infection. Proc Nat Acad Sci USA. 103, 6001-6006. Lu, G., Reinert, J.T., Pitha-Rowe, I., Okumura, A., Kellum, M., Knobeloch, K.P., Hassel, B., and Pitha, P.M. (2006). ISG15 enhances the innate antiviral response by inhibition of IRF-3 degradation. Cell Mol Biol. 52, 29-41. Mailand, N., Gibbs-Seymour, I., and Bekker-Jensen, S. (2013). Regulation of PCNA-protein interactions for genome stability. Nat Rev Mol Cell Biol. 14, 269-282. Malakhov, M.P., Malakhova, O.A., Kim, K.I., Ritchie, K.J., and Zhang, D.E. (2002). UBP43 (USP18) specifically removes ISG15 from conjugated proteins. J Biol Chem. 277, 9976-9981. Malakhova, O.A., and Zhang, D.E. (2008). ISG15 inhibits Nedd4 ubiquitin E3 activity and enhances the innate antiviral response. J Biol Chem. 283, 8783-8787. Malakhova, O., Malakhov, M., Hetherington, C., and Zhang, D.E. (2002). Lipopolysaccharide activates the expression of ISG15-specific protease UBP43 via interferon regulatory factor 3. J Biol Chem. 277, 14703-14711. Matsuda, T., Bebenek, K., Masutani, C., Hanaoka, F., and Kunkel, T.A. (2000). Low fidelity DNA synthesis by human DNA polymerase-eta. Nature. 404, 1011-1013. Melino, G. (2011). p63 is a suppressor of tumorigenesis and metastasis interacting with mutant p53. Cell Death Diff. 18, 1487-1499. Mills, A.A., Zheng, B., Wang, X.J., Vogel, H., Roop, D.R., and Bradley, A. (1999). p63 is a p53 homologue required for limb and epidermal morphogenesis. Nature. 398, 708-713. Miyashita, T., and Reed, J.C. (1995). Tumor suppressor p53 is a direct transcriptional activator of the human bax gene. Cell. 80, 293-299. Moldovan, G.L., Pfander, B., and Jentsch, S. (2007). PCNA, the maestro of the replication fork. Cell. 129, 665-679. Nakano, K., and Vousden, K.H. (2001). PUMA, a novel proapoptotic gene, is induced by p53. Mol Cell. 7, 683-694. Okumura, A., Pitha, P.M., and Harty, R.N. (2008). ISG15 inhibits Ebola VP40 VLP budding in an L-domain-dependent manner by blocking Nedd4 ligase activity. Proc Nat Acad Sci USA. 105, 3974-3979. Oliner, J.D., Kinzler, K.W., Meltzer, P.S., George, D.L., and Vogelstein, B. (1992). Amplification of a gene encoding a p53-associated protein in human sarcomas. Nature. 358, 80-83. Park, J.M., Yang, S.W., Yu, K.R., Ka, S.H., Lee, S.W., Seol, J.H., Jeon, Y.J., and Chung, C.H. (2014). Modification of PCNA by ISG15 plays a crucial role in termination of error-prone translesion DNA synthesis. Mol Cell. 54, 626-638. Park, J.H., Yang, S.W., Park, J.M., Ka, S.H., Kim, J.H., Kong, Y.Y., Jeon, Y.J., Seol, J.H., and Chung, C.H. (2016). Positive feedback regulation of p53 transactivity by DNA damage-induced ISG15 modification. Nat Commun. 7, 12513. Platanias, L.C. (2005). Mechanisms of type-I- and type-II-interferon-mediated signalling. Nat Rev Immunol. 5, 375-386. Ratia, K., Pegan, S., Takayama, J., Sleeman, K., Coughlin, M., Baliji, S., Chaudhuri, R., Fu, W., Prabhakar, B.S., and Johnson, M.E. (2008). A noncovalent class of papain-like protease/deubiquitinase inhibitors blocks SARS virus replication. Proc Nat Acad Sci USA. 105, 16119-16124. Reich, N., Evans, B., Levy, D., Fahey, D., Knight, E., and Darnell, J.E. (1987). Interferon-induced transcription of a gene encoding a 15-kDa protein depends on an upstream enhancer element. Proc Nat Acad Sci USA. 84, 6394-6398. Riley, T., Sontag, E., Chen, P., and Levine, A. (2008). Transcriptional control of human p53-regulated genes. Nat Rev Mol Cell Biol. 9, 402-412. Roos, W.P., Thomas, A.D., and Kaina, B. (2016). DNA damage and the balance between survival and death in cancer biology. Nat Rev Cancer. 16, 20-33. Rouse, J., and Jackson, S.P. (2002). Interfaces between the detection, signaling, and repair of DNA damage. Science. 297, 547-551. Sale, J.E. (2012). Competition, collaboration and coordination-determining how cells bypass DNA damage. J Cell Sci. 125, 1633-1643. Sale, J.E., Lehmann, A.R., and Woodgate, R. (2012). Y-family DNA polymerases and their role in tolerance of cellular DNA damage. Nat Rev Mol Cell Biol. 13, 141-152. Sarkaria, J.N., Busby, E.C., Tibbetts, R.S., Roos, P., Taya, Y., Karnitz, L.M., and Abraham, R.T. (1999). Inhibition of ATM and ATR kinase activities by the radiosensitizing agent, caffeine. Cancer Res. 59, 4375-4382. Sayan, B.S., Sayan, A.E., Yang, A.L., Aqeilan, R.I., Candi, E., Cohen, G.M., Knight, R.A., Croce, C.M., and Melino, G. (2007). Cleavage of the transactivation-inhibitory domain of p63 by caspases enhances apoptosis. Proc Nat Acad Sci USA. 104, 10871-10876. Stelter, P., and Ulrich, H.D. (2003). Control of spontaneous and damage-induced mutagenesis by SUMO and ubiquitin conjugation. Nature. 425, 188-191. Suh, E.K., Yang, A., Kettenbach, A., Bamberger, C., Michaelis, A.H., Zhu, Z., Elvin, J.A., Bronson, R.T., Crum, C.P., and McKeon, F. (2006). p63 protects the female germ line during meiotic arrest. Nature. 444, 624-628. Taniguchi, T., and Takaoka, A. (2001). A weak signal for strong responses: interferon-alpha/beta revisited. Nat Rev Mol Cell Biol. 2, 378-386. Ulrich, H.D., and Walden, H. (2010). Ubiquitin signalling in DNA replication and repair. Nature reviews Mol Cell Biol. 11, 479-489. Wong, J.J., Pung, Y.F., Sze, N.S., and Chin, K.C. (2006). HERC5 is an IFN-induced HECT-type E3 protein ligase that mediates type I IFN-induced ISGylation of protein targets. Proc Nat Acad Sci USA. 103, 10735-10740. Wu, X., Bayle, J.H., Olson, D., and Levine, A.J. (1993). The p53-mdm-2 autoregulatory feedback loop. Genes Dev. 7, 1126-1132. Yang, A., Kaghad, M., Wang, Y., Gillett, E., Fleming, M.D., Dotsch, V., Andrews, N.C., Caput, D., and McKeon, F. (1998). p63, a p53 homolog at 3q27–29, encodes multiple products with transactivating, death-inducing, and dominant-negative activities. Mol Cell. 2, 305-316. Yang, A., Schweitzer, R., Sun, D., Kaghad, M., Walker, N., Bronson, R.T., Tabin, C., Sharpe, A., Caput, D., and Crum, C. (1999). p63 is essential for regenerative proliferation in limb, craniofacial and epithelial development. Nature. 398, 714-718. Yuan, W., and Krug, R.M. (2001). Influenza B virus NS1 protein inhibits conjugation of the interferon (IFN)-induced ubiquitin-like ISG15 protein. EMBO J. 20, 362-371. Zhao, C., Beaudenon, S.L., Kelley, M.L., Waddell, M.B., Yuan, W., Schulman, B.A., Huibregtse, J.M., and Krug, R.M. (2004). The UbcH8 ubiquitin E2 enzyme is also the E2 enzyme for ISG15, an IFN-alpha/beta-induced ubiquitin-like protein. Proc Nat Acad Sci USA. 101, 7578-7582. Zhao, C., Denison, C., Huibregtse, J.M., Gygi, S., and Krug, R.M. (2005). Human ISG15 conjugation targets both IFN-induced and constitutively expressed proteins functioning in diverse cellular pathways. Proc Nat Acad Sci USA. 102, 10200-10205. Zhao, C., Sridharan, H., Chen, R., Baker, D.P., Wang, S., and Krug, R.M. (2016). Influenza B virus non-structural protein 1 counteracts ISG15 antiviral activity by sequestering ISGylated viral proteins. Nat Commun. 7, 12754. Zou, W., and Zhang, D.E. (2006). The interferon-inducible ubiquitin-protein isopeptide ligase (E3). EFP also functions as an ISG15 E3 ligase. J Biol Chem. 281, 3989-3994.